Corner of Bourke and Elizabeth Streets, Melbourne. The first Postmaster for Melbourne was appointed in 1838 and the first Post Office was opened on this site in 1841, providing an essential link to 'home' (England). Work commences on the 2 storey Renaissance Revival structure, with its stone fa�ade enlivened with elaborate layering of columns designed by architects including A. E. Johnson. The 2 storey building was completed in 1867. After World War I interruption, US architect Walter Burley Griffin finishes redesign, opening sorting hall to public. GPO is one of Griffin's first Australian projects. Australia Post flags end of major postal role for GPO and says it may even sell building. Shopping mall planning permit granted. Project lapses. Tuscan Hotel group proposes hotel development, including 10-level extension. Plan later abandoned. Morry Schwartz's Pan Urban and Adam Garrisson's Wetherby Capital win development rights for retail complex. GPO closes as a public facility. Melbourne GPO suffered severe damage from a fire that destroyed the heritage listed building and postal hall. GPO Morry Schwartz and Garrisson unveil GPO Melbourne concept. Like a well-loved heirloom, Melbourne's GPO has been in and out of the spotlight over the past one hundred and fifty years, but the building has remained close to the city's heart. In fact, it is the city's heart. Did you know that road distances from Melbourne are measured in kilometres from Melbourne's GPO? Melbourne's GPO's journey from postal hall to fashion hub makes for an interesting and sometimes dramatic tale. The current building was designed in neo-Renaissance style - the height of mid-1800's fashion. It is now heritage listed and considered one of Australia's most important public buildings. Here's how it all happened.. The foundation stone of Melbourne's GPO was laid on the Bourke and Elizabeth Street corner site in 1859. Between 1859 and 1867, a much grander, two-level building was developed. The architects involved in the project included A.E. Johnson, who later designed the Supreme Court. At this time customers of the post office were served via openings out onto the Elizabeth Street colonade with its classic arches. The interior of the building was essentially office and mail sorting space. In 1887, a third level was added along with the famous clock tower, which quickly became a city landmark. In one of his first Australian projects, US architect Walter Burley Griffin worked on a redesign of the building. This was finished in 1919, and the sorting hall was opened to the public for the first time. In 1992, Australia Post announced plans to end Melbourne's GPO's major postal role. It began to look as though the building would be sold. Melburnian's continued to flock to Melbourne's GPO to post letters, buy stationery, pay bills, check their PO boxes and rip pages from the regional phone directories. In 1993, a planning permit for a shopping mall on the site was granted, which raised some intrigue, but the permit eventually lapsed. In 1997, another possibility for the building emerged when developers proposed a 5-star hotel development. This included plans for a ten level extension, which would have produced a thirteen-storey hotel. Superstition must have prevailed, because this plan also lapsed. 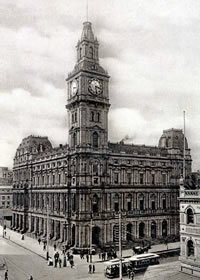 Then, in 2001, other developers won the rights to develop a retail complex at Melbourne's GPO. The centre closed as a public facility. The redevelopment plans sparked the city's curiosity, though some expressed worry at losing the regional phone book library. Indeed, their fears were realised when the building was almost gutted by fire in September 2001. The Melbourne's GPO building originally opened for trade as a retail centre in October 2004. The modern design retains many of the important heritage aspects of the site yet provides a feeling of light and space that the former layout had lacked since the early 20th century. The ceiling was restored and a lighter paint shade returned as per the original design. Cafes on the outer colonade take advantage of Venetian style dining as guests spill out onto often sunny steps. In 2005 ISPT purchased the building. Melbourne's GPO makes for a totally unique retail and leisure experience. Escape hectic Bourke Street Mall, and enter the calming and irresistible draw of the CBD's premier boutique shopping destination. With over 50 stores across three floors, Melbourne's GPO houses a diverse mix of dining options, the biggest names in Australian and international designer fashion, alongside exceptional event spaces which have been designed to impress.